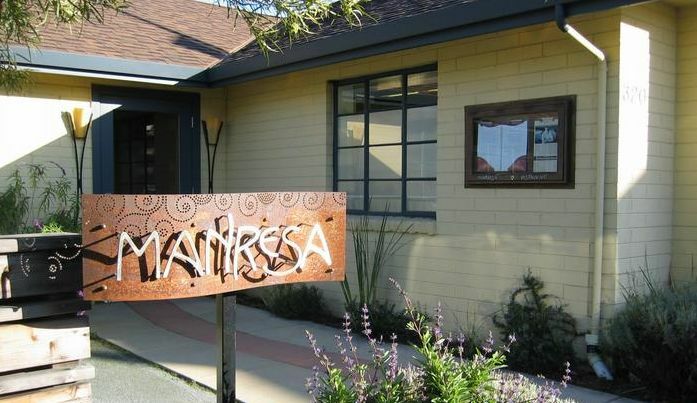 Manresa is located at the base of the Santa Cruz foothills in the quaint town of Los Gatos, California. Manresa offers Contemporary French cuisine with Catalonian flair. 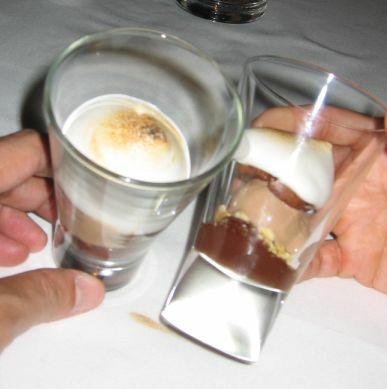 Very recently, the Michelin Guide awards Manresa "2 stars" in its first Bay Area guide. Very few restaurants get on the list, much less the 2 star rating. In the Bay Area and Wine Country, only three other restaurants received two stars: Aqua in San Francisco, Michael Mina in San Francisco and Cyrus in Healdsburg. We had to wait for 3 months to get a reservation and we did not even get prime time! Our reservation was at 5:00Pm on a Sunday. The building is a ranch house just off Santa Cruz Avenue, in which chef David Kinch designed his dream kitchen and a 68-seat dining room with a modern, casual atmosphere. 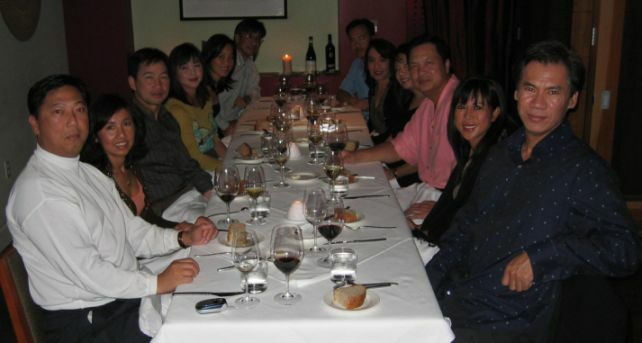 Here is the gang.... Dung, Phuong, Tuan, Mai-Ly, me, Hoa, Duy, Thuy, Phuc, Huyen, Hanh and Tuan, on our second culinary experience after the French Laundry. 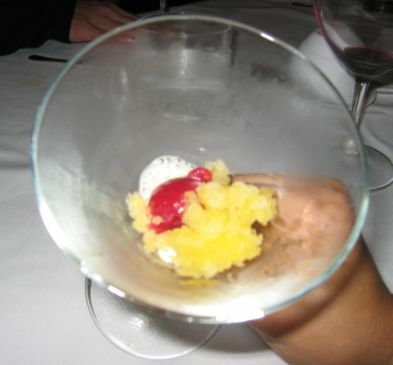 We picked the Chef's tasting menu comprising of an 18-course dinner including the Amuse Bouche. 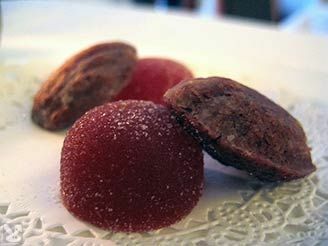 Black olive Madeleines and red pepper gumdrops. The olive-laced Madeleines are warm and crisp on the outside and has an interesting flavor. The savory gumdrops balanced them with a hint of the pepper’s natural sweetness and a dusting of sugar. Even though, I did not really care for the gumdrops. 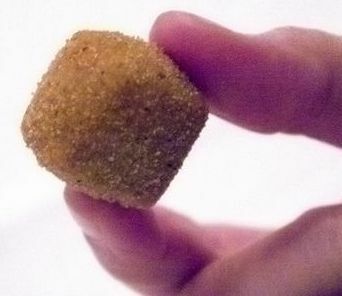 The 2nd Amuse bouche is a Winter Croquette with Liquid Foie Gras to be eaten in one bite! When you bit into the croquette the liquid just oozed out.. Very nice and unexpected! 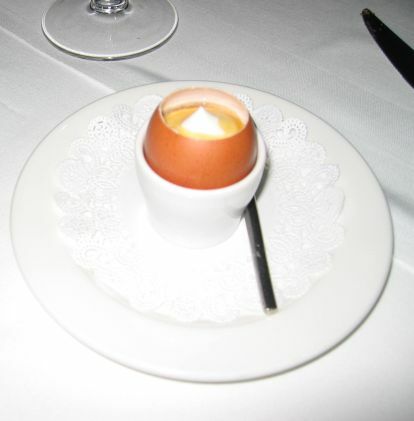 Chef Kinch's signature dish: Arpège Egg. The egg is coddled for 60 seconds and served in the shell with a drizzle of maple syrup, chives and crème fraîche. You have to spoon all the way to the bottom and scoop up the soft, golden yolk, surrounded by clouds of whipped cream. Nice combination of hot/cold, sweet/salty, all in the same bite. 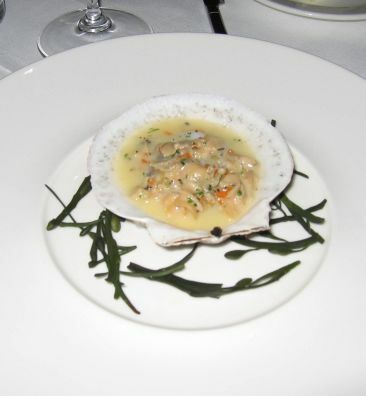 The Oyster and Uni in Sea water Gelée. 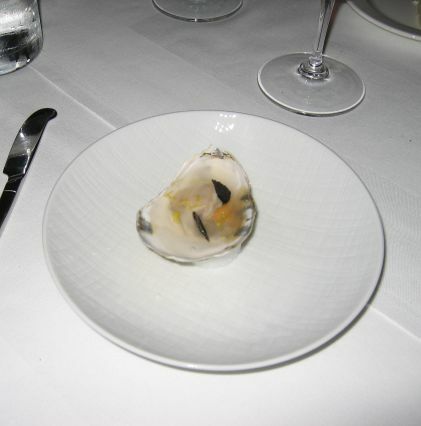 I rather have a raw fresh oyster, just chucked and top with a dash of lemon! Nature at it perfection! Slow wood grilled/smoked Foie Gras on a Quince Consommé, piece of toast and a dash of Quince syrup. Very generous portion! 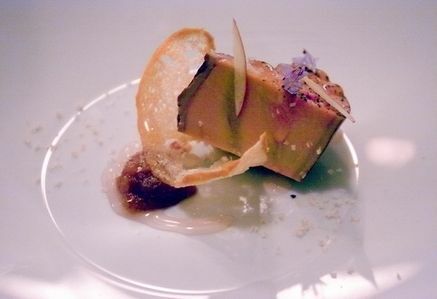 I enjoy the smokiest flavor but however the Foie Gras was cold, the Quince syrup tasted so sweet without any flavor. Where is the seared Foie Gras with balsamic reduction and grapes that we had at the Ngo's? Bay abalone arrive meunière-style atop creamy. The taste was o.k but forgettable. I did not remember this dish until I saw the picture. John Dory on the Plancha, roast shellfish juice on a bed of root vegetable puree. This is my favorite dish of the night! 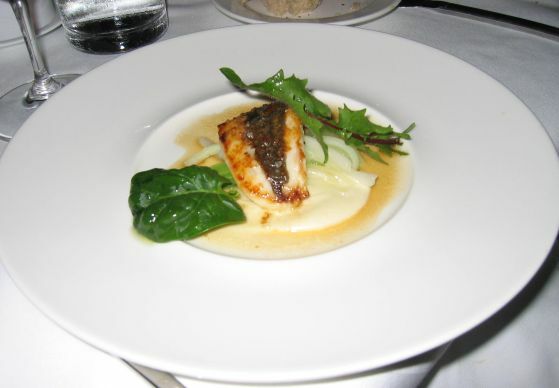 the fish was just cooked right and I like the puree too. 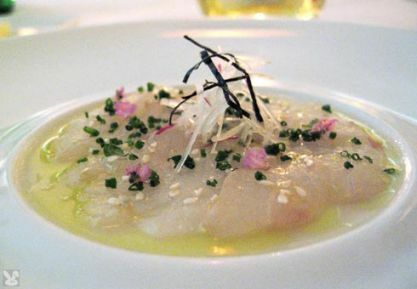 Amber Jack and shellfish, Sashimi style, with olive and Citrus zests. I like this dish, very light and the citrus zests help make this dish taste so fresh and delicate. This is also one my favorite dish of the evening. 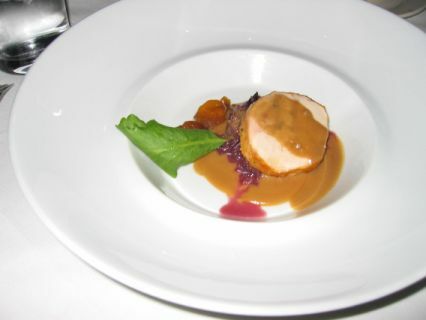 Farm Poularde (overfed chicken) with beet bavette in a brown sauce. I thought this dish is good but not excellent and not memorable. 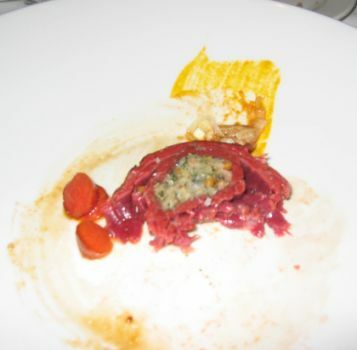 This is a 28 day aged grilled beef loin with carrots and some kind of stuffing in the middle. Again tasted like a steak maybe firmer than a regular steak. The stuffing was also bland and forgettable. This picture was taken after I took more than a few bites! This is our dessert! What a disappointment! Melted mashed mellow on top, with chocolate mousse and a small cookie inside. I definitely was expecting something fancy, perhaps like a soufflé or something satisfying to the eye and my taste bud. I got none of it! Not to brag but I can make better dessert! Chocolate Madeleines with strawberry gumdrops. 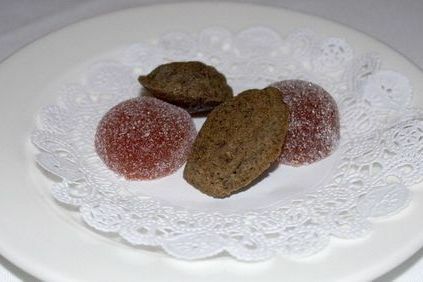 The meal came full circle and ended as it had begun, with dessert madeleines and gumdrops. The beginning of the meal was savory Madeleines and the ending was sweet Madeleines. The 1st time I went to Manresa, about a year ago, we choose a 4-course dinner and I really truly enjoyed the food. This time around I really wanted to fall in love with Manresa all over again, but unfortunately that did not happen! I left the restaurant disenchanted with a hole in my pocket and a stomach ache (must be the egg). So what happened, you may ask? A two stars restaurant not up to my expectation? Aren't I supposed to be amazed by the food? What is wrong with this picture? Well, to sum it up, the food was just boring and the "WOW" factor was no where to be found. I don't want to sound like a culinary snob but someone got to do it! I give Manresa a big "O" for overrated. Sorry David Kinch!